New financial services challenges – are you ready for Modern Payments Systems, IoT and blockchain? Mobile banking, 24-hour trading, and product innovation has driven the digital transformation. The result has been a tremendous rise in the amount of data to be processed which has created enormous pressure on the performance and scale of applications. In the face of evolving technology and new regulations, the financial services industry faces a number of technical challenges, including fraud prevention, high-frequency trading, and real-time regulatory compliance. Meanwhile, three new technologies… modern payments systems, the IoT (Internet of Things), and blockchain…offer the industry tremendous new revenue opportunities if firms are ready to implement them. For modern payment systems, an in-memory computing platform can provide response times that are 1,000 to 1,000,000 times faster than traditional approaches based on disk-based databases. For IoT applications, an in-memory computing platform, perhaps more than any other technology, enables organizations to cope with the ever-growing, ever-accelerating stream of real-time data. For Bitcoin infrastructures, an in-memory computing platform provides the performance and scale necessary to scale and secure the underlying blockchain distributed ledger technology. The scalability of the computing cluster, which automatically utilizes the RAM and CPU power of each new server added to the cluster, means firms can provide the required level of performance and security at scale. 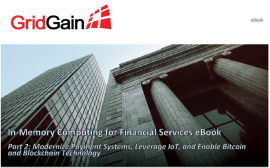 Download the “In-Memory Computing for Financial Services eBook, Part 2,” published by GridGain Systems, and get a detailed look at how in-memory computing platforms can help financial services firms leverage in-memory computing to take advantage of modern payments systems, the Internet of Things (IoT) and blockchain. Please fill in the form below to download the free e-book. Just a couple of clicks and it is all yours! By downloading this e-book you agree to share your details with GridGain Systems. In-memory speed, unlimited horizontal scalability and broad integration to support any future needs. What would you do with $339 million? London-based mobile operator Truphone gets to answer that question today as it closes its $339 million (£255 million) private equity round. As businesses cope with an explosion of data and users who expect real-time insights, many have turned toward in-memory computing solutions. As a result, in-memory computing platforms are becoming key infrastructure components for a growing number of organisations. Has written letters to the CEOs of Intel, AMD and ARM. He also praises eating insects.